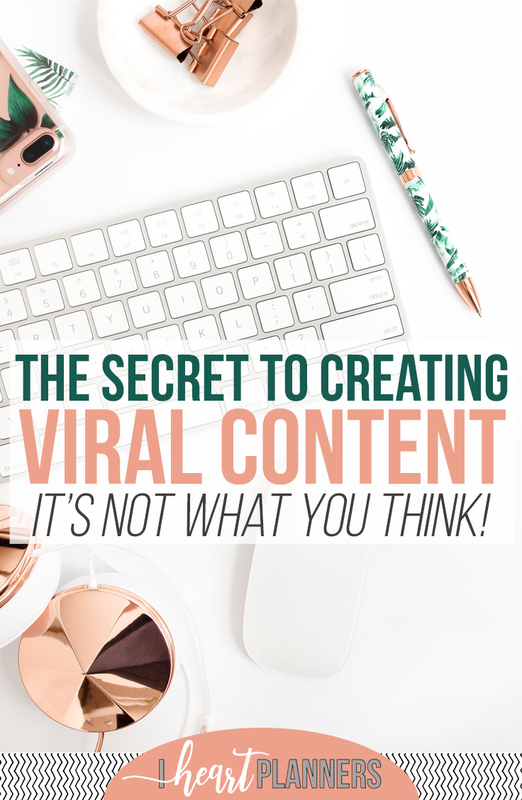 Let me guess…as a blogger or online business owner, you want to create viral content, right? You want to create the kind of content that everyone loves and that gets shared like crazy and brings tons of new people flocking to your website – preferably without having to spend a dime on paid advertising. The real question, though, is how on earth do you create that type of content? How do you know what will go viral and what won’t? What’s the viral content secret???? Well, the secret probably isn’t what you think. You see, a couple weeks ago, I had a post go crazy (in a good way) for me on Facebook! It was amazing. Most things I post to my Facebook page get a reach of about 500-1500, 3 or 4 likes, 1 share, and no comments. Even my best post in the past year had a reach of around 10,000 and just a few comments and shares. Well, the thing I posted a week and a half ago, got a reach of over 25,000, over 200 comments, and over 60 shares in the first 3 days alone with ZERO ad spending. Woohoo! So, what’s my secret? Why did that particular piece of content do so much better than everything else? Here’s what I did: I stepped WAY out of my comfort zone and did something completely new. And the craziest part is that I was so terrified of that leap outside my comfort zone that it almost didn’t happen. It was about 2pm on Tuesday afternoon. It had been a crazy day. I took my little guy to his one-year doctor appointment where he had to get 5 shots!! (Yes, that’s the routine number of vaccines they give at the one year visit these days.) He was a such a champ about it, though, and by some miracle I got both kids to nap at the SAME TIME!! It was pouring down rain, and, honestly, I really felt like curling up on the couch with a blanket and a good book. However, I wanted some video footage of some of my new back to school planner printables, so I lugged my tripod out to the covered back porch and got to work. I almost talked myself out of it because my big fancy camera is off at Canon getting repaired (for $800 – ugh!!!) and all I had was my iPhone. But I used what I had. I got the footage I needed and the kids were both still napping. 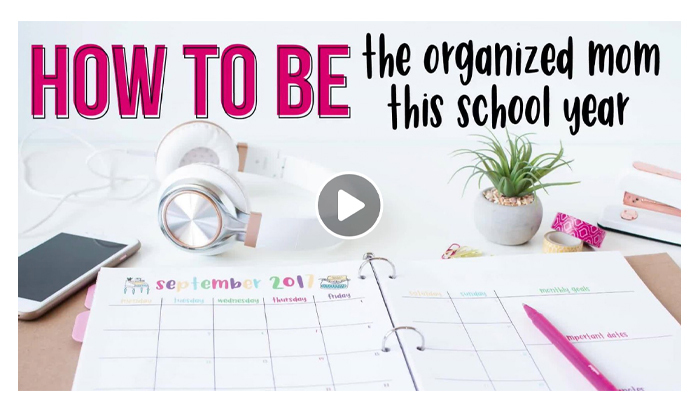 So I decided to film a quick face on camera video about my top 3 tips for how to be the organized mom this school year and also give a little plug for the back to school printable pack at the end. I really wanted to do about 50 takes to get it as right as possible, but I had a very small window of time to squeeze the filming in while the kiddos were napping and the rain wasn’t pouring down so hard that I couldn’t be heard on the video. So I did the best I could with what I had. I edited the video, and I almost didn’t post it. I DO NOT like watching videos of myself. The absolute worst are “face on camera” videos. I sound funny, I look funny, I can’t stand completely still to save my life, and HAVE YOU SEEN how much I talk with my hands? My fingernails aren’t painted. My lipstick is WAY too red. People are probably just going to laugh their heads off when they see the video. The lighting wasn’t great, either. You could hear and see cars going by in the background (if you look closely). Why should I even bother posting it? But, I knew it was different than anything else I had ever posted and I had to try something, so I went for it! And guess what? The results blew me away. It definitely was not perfect. It was not beautifully produced. But it worked, and it resonated with people. It got my message across. And that’s what matters. So, my best advice for you to create viral content is to keep trying new things. Don’t just stay right in your comfort zone. And the only thing that’s certain about managing a profitable business in this online world is that you have to constantly be changing and testing new things. I also want to point out that you probably won’t have amazing success every single time you try something new. Some things will work well. Some things won’t. I’m sharing my success story here, but I assure you that for every success, there are at least five things I tried that did NOT turn out the way I hoped. So don’t get discouraged if some things don’t work quite as well as you hoped. Just keep trying. Leave a comment below and let me know what new thing you plan to try soon. P.S. If you’re curious about the video, you can see it here. This is such great inspiration! As a new blogger, I’ve been a little intimidated by requesting to be added to group boards on Pinterest (Sounds so silly, right?). I’m going to give it a try. Awesome that you went for video and got great results! Way to go! So Cool! I love that you said it wasn’t “perfect” and that you used your iphone. Sometimes I get paralyzed because something isn’t perfect, but then I end up doing nothing which is never going to get ANY results! Thanks for the post, and hugs to your little guy!